Below you will find your affiliate resources. These are crafted to ensure they convert like crazy and make you maximum commissions. Simply copy and paste to start making money selling InstaBuilder. Would that benefit your business? delayed content, split testing, viral download locking, point and click graphic addition, font style control, autoresponder integration and much more? I personally create dozens of squeeze pages every month. And let me tell you, creating highly converting Squeeze Pages can be a time sucking task! Post 5:Ever Wonder How The Gurus Create Such STUNNING Landing Pages and Video Sales Pages So Quickly? Well I think I’ve Uncovered Their Dirty Little Secret. Post 6:Landing Pages are Essential If You Are Trying to Make Serious Money Online. 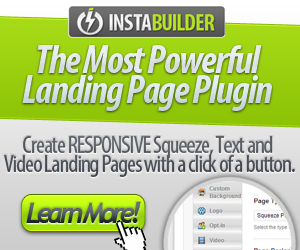 This Tool Reduces Creating STUNNING Responsive Landing Pages To a Click of a Button. Post 7:Mobile and Tablet Traffic Are Taking Over PC Traffic, Are Your Landing Pages Ready For the Big Shift? Here’s How You Can Create Self-Responsive Landing Pages With a Click of a Button. Copyright © 2013 InstaBuilder.com. All rights reserved.